By Aleiya Lonsdale, Paul Sarjeant, Matt Gradidge, Warwick Jackson and Maria Jones! On the day of the summer solstice (the 22nd day of June), quite possibly the sunniest day of the year! 5 fearless adventurers set off on a journey. A journey that would break and then re-form these characters in a way they would never imagine. From bright-eyed enthusiastic cyclists, to a company of hummock hating, rise resenting, down despisers. 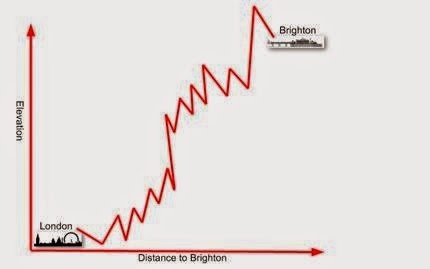 For those who are interested to see the exact route we took, I have configured a route based on elevation from our start point at the London eye DOWN to the lovely Brighton coast. If anyone you know ever says that they are going down to the coast then they are liars! I would like you all to take a look at this highly accurate map, as quite clearly the coast is in no way a downhill journey from London. Could a More Collaborative Approach Have Saved English Football? The disappointing results from Brazil lead me to question if a more collaborative effort between Wales, Ireland, and Scotland, along with the English squad could have resulted in a stronger side? If we had been Team GB, would the results have been better, would the resource pool have been richer and could the random Scottish Guy have cheered for GB instead of Uruguay? Another year passes and so does yet another brilliant BravoConnect, bringing together procurement leaders from all walks of life, industries and countries, with two things in common; the first being connection to BravoSolution and the second being a desire to connect with other procurement professionals. Day one of this two day conference and networking event (with additional dinner and all out party between the two days) opened with the event chair and BravoSolution UK & Ireland Managing Director Richard Hogg along with BravoSolution CEO Nader Sabbaghian. The event, in Richard’s words, was about connecting with clients and stakeholders to help us shape our offering to meet the needs of our client base. Nader introduced a few concepts that were built upon throughout the morning sessions. He likened procurement to the roots of a great tree, an interesting concept with procurement managing connections both inside and outside of organisations through the supply base. The efforts and connectivity is not always visible at the end result but has a huge influence on helping the organisation stay upright. I agree whole heartedly with this analogy. 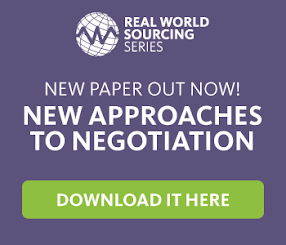 It adds a lot of weight to the growing importance of procurement.